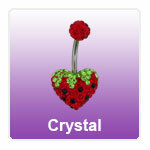 Crystal set belly bars and belly rings. These unusual belly rings are set with stunning crystal jewels and are available in a range of shaft lengths and materials. High quality crystal belly bars from JoBananas.